My aunt found some great things for me to use for some of my projects. I love the uniqueness of each of these pieces. I'm not sure what I'll use them for yet but I'm sure I will find something! 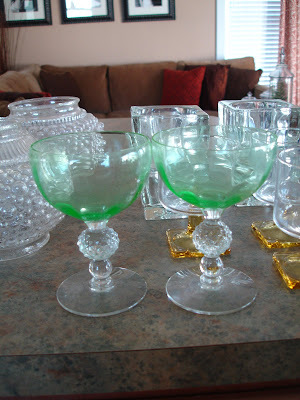 I love them all but my favorite is this set of glasses! They are so unique and I love the color of them. I think they would make a great pedestal for a cake plate or they are so cute the way they are I might just use them for special desserts sometime, like chocolate mousse! Thank you so much Aunt Ju Ju! 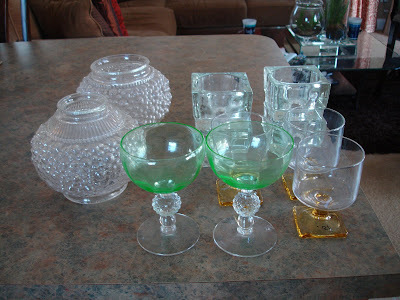 This weekend I found lots of treasure going thrifting with my mom that I will have to share as well! I worked on a lot of projects too so I will share them with you this week!